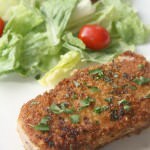 These herb crusted pork chops are so good! They are moist and tender in the middle and crunchy and savory on the outside. This is such an easy and yummy dinner that it has quickly become one of my go-to, family favorite dinner ideas. Preheat oven to 400 degrees F. Spread mustard evenly over pork chops. Combine Panko, thyme, parsley, salt and pepper in a large bowl and dip and cover the pork chops in Panko mixture. Heat a large ovenproof skillet over medium-high heat. Add oil to pan and swirl to coat. Add pork chops, sear for 2 minutes on each side, or until golden brown. Place skillet in oven for 10 minutes.